With Buddhist Nun Ven. Aileen Barry. One of our international online offerings. Anyone around the world can join from their computer in your own home for a guided healing meditation. We’ll offer different guided visualizations to help relax the mind, ease stress, and promote inner & outer healing. You can calculate the time the meditation sessions will take place at your location HERE. Free meditation sessions, offered by Gonpo Ludup. Irish nun Ven. Aileen Barry, based at Jetsunma Tenzin Palmo’s nunnery, Dongyu Gatsal Ling, in Himal Pradesh, India, will be leading these meditation sessions for us. Ven. Aileen worked for years as Liberation Prison Project’s Australian coordinator, running the office in the Blue Mountains outside Sydney. 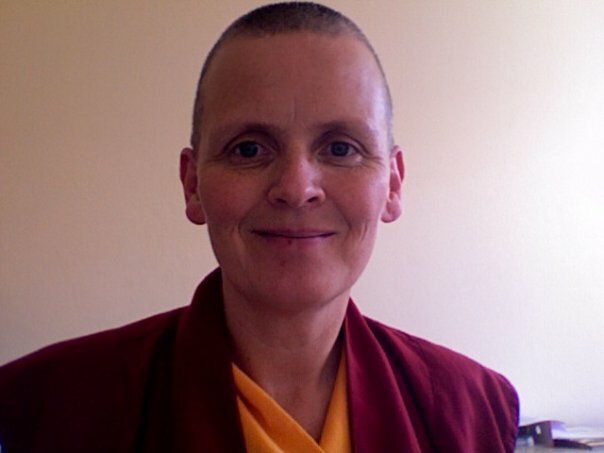 She’s also served as one of the resident monastics at FPMT’s Vajrayana Institute in Sydney; has worked for The Dalai Lama in Australia, helping coordinate His Holiness’s visits to Australia; and currently serves as Jetsunma’s attendant at Dongyu Gatsal Ling.